Testosterone increases muscle mass and strength, and regulates other physiologic processes, but we do not knowwhether testosterone effects are dose-dependent, and whether dose requirements for maintaining various androgen-dependent processes are similar (Bhasin et al. 2001). Androgen receptors in most tissues are either saturated or downregulated at physiologic testosterone concentrations (Antonio etal. 1999; Dahlberg etal. 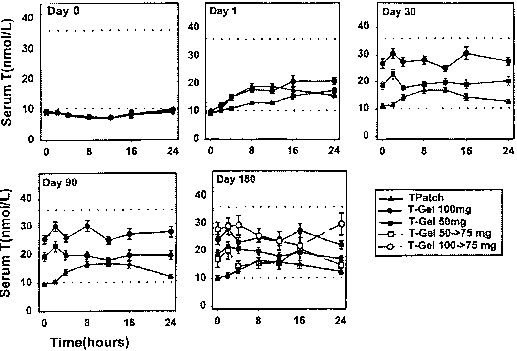 1981; Rance and Max 1984; Wilson 1988), leading to speculation that there might be two separate dose-response curves: one in the hypo-gonadal range with maximal response at low normal testosterone concentrations, and a second in the supraphysiologic range, representing a separate mechanism of action (Bhasin et al. 2001; Wilson 1988). However, testosterone dose-response relationships for a range of androgen-dependent functions in humans have not been studied. to one of five groups to receive monthly injections of a long-acting GnRH agonist to suppress endogenous testosterone secretion, and weekly injections of 25, 50, 125,300 or 600 mg testosterone enanthate for 20 weeks (Bhasin etal. 2001b; Singh et al. 2002; Woodhouse etal. 2003). Energy and protein intake were standardized. The administration of GnRH agonist plus graded doses of testosterone resulted in mean nadir testosterone concentrations of 253, 306, 542, 1345, and 2,370 ng/dL at the 25, 50, 125, 300, and 600 mg doses, respectively (Fig. 8.1). Fat free mass increased dose-dependently in men receiving 125, 300 or 600 mg of testosterone weekly (change +3.4,5.2, and 7.9 kg, respectively). The changes in fat free mass were highly dependent on testosterone dose (Fig. 8.1, P = 0.0001) and correlated with log testosterone concentrations (r = 0.73, P = 0.0001). Changes in leg press strength, leg power, thigh and quadriceps muscle volumes, hemoglobin, and IGF-1 were positively correlated with testosterone concentrations, while changes in fat mass and plasma HDL cholesterol were negatively correlated. Sexual function, visual-spatial cognition and mood, and PSA levels did not change significantly at any dose. These data demonstrate that changes in circulating testosterone concentrations, induced by GnRH agonist and testosterone administration, are associated with testosterone dose- and concentration-dependent changes in fat free mass, muscle size, strength and power, fat mass, hemoglobin, HDL cholesterol, and IGF-1 levels, in conformity with a single linear dose-response relationship. However, different androgen-dependent processes have different testosterone dose-response relationships. Despite strong correlation between testosterone dose and changes in fat free mass and muscle size, there was considerable heterogeneity in individual responses to a given testosterone dose. We investigated whether testosterone dose and/or any combination of baseline variables including concentrations of hormones, growth factors, age, measures of body composition, muscle function, muscle morphometry or polymorphisms in androgen receptor could explain the variability in anabolic response to testosterone (Woodhouse et al. 2003). Anabolic response was operationally defined as a change in whole body fat-free mass (FFM) (by DEXA), appendicular FFM (by DEXA) and thigh muscle volume (by MRI) during testosterone treatment. We used univariate and multivariate analysis to identify the subset of baseline measures that best explained the variability in anabolic response to testosterone supplementation. The three variable model of testosterone dose, age and baseline prostate specific antigen (PSA) level explained 67% of the variance in change in whole body FFM. Change in appendicular FFM was best explained (64% of the variance) by the linear combination of testosterone dose, baseline PSA and leg press strength, while testosterone dose, log of the ratio of luteinizing hormone (LH) to testosterone (T) concentration (LH/T) and age explained 66% of the variation in change in thigh muscle volume (MRI). The models were further validated by using Ridge analysis and cross-validation in data subsets. Only the model using testosterone dose, age, and PSA was a consistent predictor of change in FFM in subset analyses. The length of CAG tract of the androgen receptor was only a weak predictor of change in thigh muscle volume and lean body mass (LBM) in this small sample. Thus, the anabolic response of healthy, young men to exogenous testosterone administration can be predicted largely by the testosterone dose (Woodhouse etal. 2003). Further studies are needed to elucidate the genetic basis of natural variation in androgen responsiveness and to test the generalizability of the proposed prediction models.